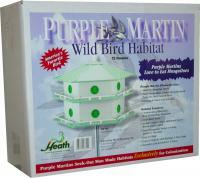 Whether you're trying to expand your Purple Martin colony or want to start a new one, this Purple Martin House from Birds Choice will attract Purple Martins from all over. 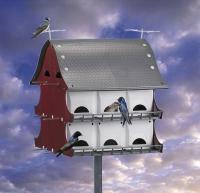 Any experienced Purple Martin landlord knows that starlings can be a huge problem. 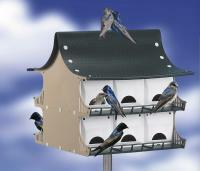 Fortunately, this house features starling-resistant entrance holes that are 99.8% effective at keeping the invasive birds out. 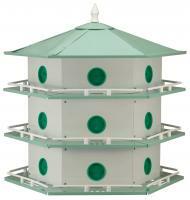 Even though the crescent holes are cut to keep out starlings, they're the perfect height to allow safe entry for Purple Martins. The house itself comes with a reflective roof, which also has a ceiling panel for proper ventilation, porch dividers, guard rails, and a top perch. It even has hinged doors to make cleaning out the aluminum and stainless steel house a breeze.